Ministers have been told “judgement day is coming” over Brexit as the UK and EU strive for a deal within 48 hours. 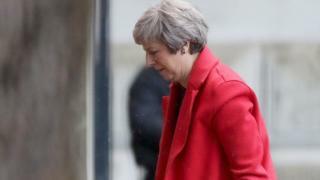 Officials are trying to hammer out an agreement on the terms of the UK’s exit by Wednesday to enable EU leaders to agree it by the end of the month. Downing Street said talks had gone on through the night but “substantial issues” still remained to be resolved. Amid growing pressure on the PM, one Tory said MPs will be “judged at the bar of history” if they back her plans. Mark Francois compared Mrs May’s handling of the Brexit negotiations with the fall of Singapore to the Japanese in World War Two, complaining of “one tactical defeat after another”. A growing number of Tory MPs are warning the prime minister that her Brexit plan will not be approved by Parliament while Labour’s Brexit spokesman Sir Keir Starmer has said MPs will not allow the UK to leave without a negotiated agreement and “technically” the whole process can be stopped. The uncertainty has been reflected on the financial markets, with sterling falling 1% against the dollar. before recovering slightly. Why is it crunch time for the negotiations? The UK is set to leave the EU on 29 March 2019. Negotiations are continuing on the so-called “divorce” agreement and an outline declaration on the two sides’ future relationship. The next 48 hours are set to be critical in the process. Both sides want to schedule a special summit of EU leaders at the end of November to sign off the withdrawal deal but the EU says it will only agree to this if agreement can be reached on the issue of the Irish border. Time is running out to put the wheels in motion for the summit. EU member states need time to scrutinise any agreement before the gathering and the European Council’s president Donald Tusk has reportedly said a deal must be reached by Wednesday evening at the latest. Following an update by their Brexit negotiator Michel Barnier on Monday, EU officials played down talk of a breakthrough, saying “intense negotiating efforts continue, but an agreement has not been reached yet”. However, the Financial Times reported that Mr Barnier told EU diplomats that the text of an agreement was “almost ready” and everything hinged on whether Mrs May could muster enough political support in the UK. A November summit is a key staging post in trying to avoid the UK leaving without a deal. If the decision is pushed back to the next scheduled meeting in December, no-deal preparations will have to be ramped up significantly and the chances of getting it through the UK and EU parliaments will recede. The negotiators have been burning the midnight oil in search of a deal. Talks continued to nearly 03:00 GMT on Monday and have since resumed in Brussels. The EU said key issues remained “under discussion”, in particular over finding a solution to avoiding a hard border between Northern Ireland and the Republic of Ireland. Downing Street said some progress had been made but the proposed Irish backstop – a fallback arrangement for avoiding border checks, which would see the UK remain in a temporary customs arrangement – had not been agreed. Amid claims a special cabinet meeting scheduled for Monday to approve the deal had had to be postponed, No 10 said ministers would only be asked to approve the draft agreement when it was ready. Other sticking points include EU demands for a “level-playing field” in labour regulations and environmental standards during any temporary customs arrangement, so UK firms cannot undercut their European counterparts. 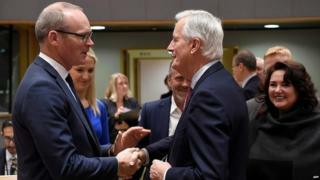 Irish foreign minister Simon Coveney said it was a “very important” week for the Brexit process and the sooner the two sides bridged their differences the better. Theresa May is coming under increasing pressure from both Brexiteers and Remainers. In his latest column for the Daily Telegraph, Boris Johnson called for a “cabinet mutiny” against the PM’s proposal for the UK to sign up to EU rules in trade in goods without, he said, having any say in them. Mr Francois, the vice-chairman of the European Research Group of Tory MPs, said it was an open secret that five or six cabinet members were very unhappy with the PM’s proposals and urged them to show “moral courage”. International Development Secretary Penny Mordaunt said the cabinet would be a “check” on whatever deal was agreed and suggested she could not support anything which did not respect the 2016 referendum result. Former education secretary Justine Greening, who backs another referendum on Brexit with the option to remain in the EU, said there was “no chance” of the PM’s blueprint for future relations being approved by MPs. But Mrs May has received the support of one prominent Brexiteer in the cabinet. Environment Secretary Michael Gove said she was trying to get the “very, very best deal” for Britain. It’s not only Conservative divisions which are on show over Brexit. Labour continues to struggle to read from the same script when it comes to another UK-wide vote. In an interview with a German magazine on Friday, Jeremy Corbyn said the public had already had their say and Brexit could not be stopped. He later told Channel 4 his priority was the UK’s new relationship with Europe. 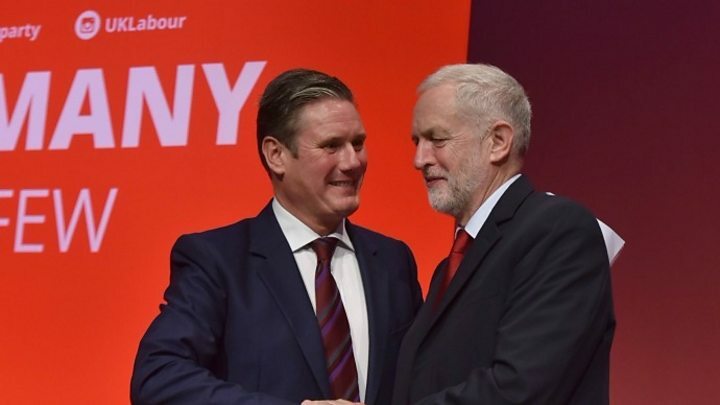 Sir Keir Starmer, the party’s Brexit spokesman, disagrees, pointing out that Labour members voted to keep all options open at their conference and Parliament would not allow the UK to leave without some form of agreement. 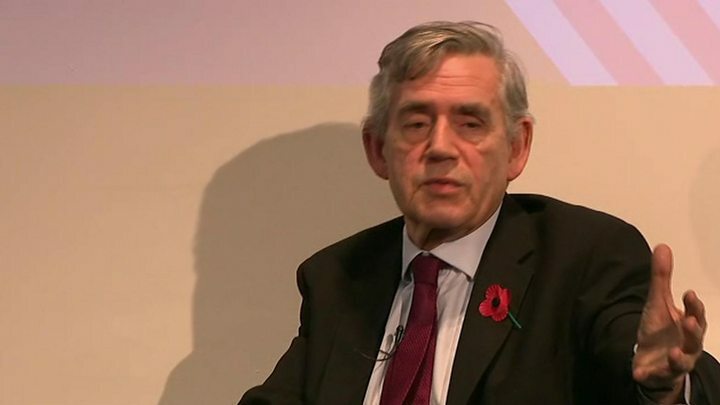 And former prime minister Gordon Brown believes another referendum is inevitable at the some stage, although he will not predict when this might happen. In a speech to the Institute for Government in London on Monday, he claimed Brexit was now “more divisive” than either the Iraq War or the Miners Strike and the door must be left open to the UK rejoining the EU one day.